How to set up a basic QSurfaceDataProxy and set data for it. How to use QHeightMapSurfaceDataProxy for showing 3D height maps. Three different selection modes for studying the graph. Axis range usage for displaying selected portions of the graph. How to set a custom surface gradient. For instructions about how to interact with the graph, see this page. The call to QWidget::createWindowContainer is required, as all data visualization graph classes (Q3DBars, Q3DScatter, and Q3DSurface) inherit QWindow. Any class inheriting QWindow cannot be used as a widget any other way. The rest of the code in main.cpp is creating control widgets for features in Q3DSurface. We have separated code for changing these features into surfacegraph.cpp and only connect signals from widgets into methods in surfacegraph.cpp. Next chapter explains more about using Q3DSurface. Then we fill the proxy with a simple square root and sine wave data. This is done by creating a new QSurfaceDataArray instance and adding QSurfaceDataRow elements to it. The created QSurfaceDataArray is set to be the data array for the QSurfaceDataProxy. // to the rounding errors. The height map is created by instantiating a QHeightMapSurfaceDataProxy with a QImage containing the height data. The method QHeightMapSurfaceDataProxy::setValueRanges() is used to define the value range of the map. In our example the map is from imaginary position of 34.0° N - 40.0° N and 18.0° E - 24.0° E. These values are used to show and position the map to the axis. When the Height Map radio button is activated, the following code sets the correct series active. The axis label format is set to show N and E letters and ranges are set to the imaginary coordinates. Auto adjusting Y-axis range is fine for our height map surface, so we ensure it is set. 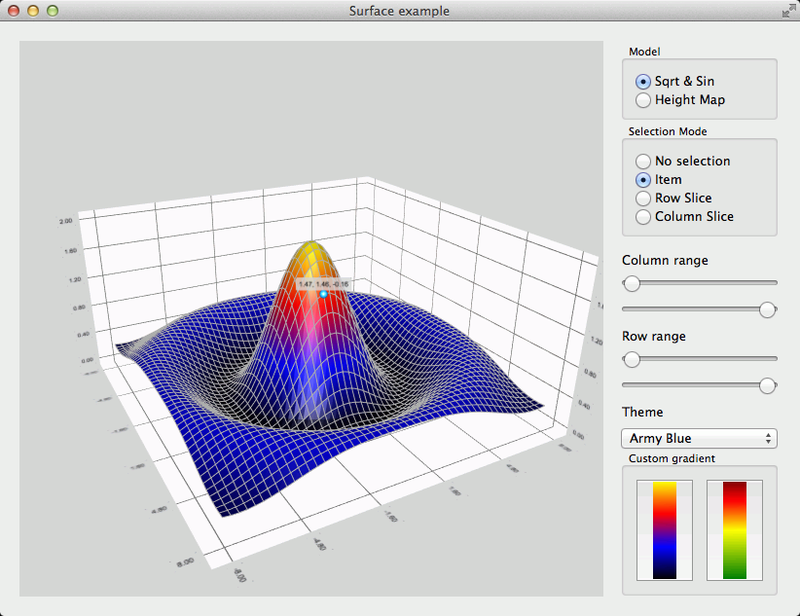 Q3Dsurface supports three different selection modes. These are demonstrated in the example with radio buttons, which the user can use to activate a suitable selection mode. The following inline methods are connected to radio buttons to activate the selected mode. The example demonstrates the custom surface gradients with two push buttons. The gradient can be defined with QLinearGradient where the desired colors are set to positions. The following code shows how to create an example gradient and set it to the series. Note that you also need to change the color style to Q3DTheme::ColorStyleRangeGradient to actually use the gradient.